TweakNow PowerPack is a fully-integrated suite of utilities that let you fine-tune every aspect of your computer’s operating system and Web browser. 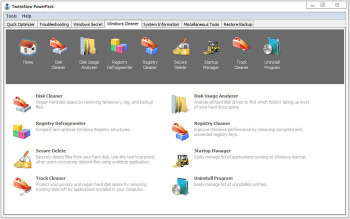 The Registry Cleaner module provides you with a safe and simple way to clean Windows Registry. To keep your computer always at top performance, we recommend to clean your registry at least once a month. For Windows tweaking lovers, the suite provides more than 100 hidden Windows settings in the Windows Secret section. Using modules included in this section, you can easily customize your Windows like geeks do. The Virtual Desktop module lets you run as many as four custom-designed desktop configurations simultaneously, allowing you to tailor your computer screen to your mood and your work requirements. Last but not least, the suite also gives you a complete picture of all aspects of your computer’s hardware, including detailed information about your motherboard, processor, video card, memory, hard disk and network. In the first tab you can clean your Windows registry, traces from web browsers, traces from Windows and third-party apps, compact Google Chrome and Mozilla Firefox database files, clean Windows temp files, as well as optimize Windows and network settings. In addition, you can select troubleshooting options (check for graphics card updates, rebuild icon cache, reset network settings), view system information and restore backups. But you can also access other functions (automatic shutdown, RAM optimizer, virtual desktop, process manager, TweakNow shortcuts) and use Windows cleaning tools, such as “Disk Cleaner”, “Disk Usage Analyzer”, “Registry Defragmenter”, “Registry Cleaner”, “Secure Delete”, “Startup Manager”, “Track Cleaner” and “Uninstall Program”. Last but not least, you can customize your operating system when it comes to Internet Explorer (e.g. default search engine, restrictions), Control Panel (e.g. applets, personalization), desktop (e.g. icons), Internet and network, OEM information, special folders, Windows core, and others. The software uses a moderate amount of system resources, includes a help file, didn’t freeze or crash during our tests and its overall response time is very good. The bottom line is that TweakNow PowerPack is an excellent program that incorporates useful modules you need to configure and optimize Windows. We strongly recommend it to all users.